Well I don't think anyone can be unhappy with that result can they? Going into the final ten minutes I was happy we would probably take a point from the game if we continued to fight the way we were. However I did feel on the basis of out performance we probably deserved to take home all three points. Then Aaron Ramsey turns up at the back post and the rest is history. Arsenal really turned up as a team for the game. I thought we all worked hard for one another and our defending, whilst at times was last gasp, was good and it's looking like the work at the training ground is paying off. Arsene Wenger went into this match by making two changes to the side which won at Sunderland. The injured Kieran Gibbs was replaced by Andre Santos and Andrey Arshavin coming in for a rare start in place of Gervinho who dropped to the bench. The team did seem to have the right balance. However it appeared our game plan was to push our full backs on to make sure the home side couldn't get at us down the wings because their attackers would have to be defending inside their own half. And it worked. Carl Jenkinson and Andre Santos with good contributions going forward. Our dogged midfield three of Rosicky, Arteta and Song made sure they broke up play well and that we turned defence to attack as quickly as we could. There wasn't much creative about the way these three played during the majority of the game but they got stuck in doing the dirty work to ensure our defence wasn't left exposed. At the back I thought the Mertesacker/Koscielny partnership was superb. Whilst the German has earned praise for his measured performances, I think in European football is where we've seen the best of the Frenchman. We all know how he marshaled Messi when we played Barcelona. But I think last night we again witnessed another shift were he didn't put a foot wrong. He was quick to clear danger. Read the game well and anticipated attacking threat and then tried his best to score at set pieces in front of the Marseille goal. Personally he was my man of the match. A quick mention of Theo Walcott's performance. How can Theo believe he's good enough to play as a central striker when he can't score a good opportunity like the one which presented itself to him last night? If Walcott wants to play down the middle he's got to be scoring those. That's not the first time he's mucked up when it's seemed harder for him to miss than to put the ball in the back of the net. He shot straight at the keeper when we played Bolton last month when through on goal. Walcott has seen Arsene Wenger bring in three players who can play on the wings in the summer in Gervinho, Miyaichi and Oxlade Chamberlain. Now he keeps banging on about playing down the middle because he knows it won't be long before he's not first choice in his current position. But he's failed to realise he's not good enough in front of goal and that's why the manager won't play him there. In my opinion Theo's not as good as he thinks he is. He's got no tricks and the only way he can get passed a player is with his pace. It's lucky for him Wenger has had other areas of the team to worry about more because he could have been axed a lot sooner. Whilst he's good at what he does and is still young, I really want to see him leap forward and become a stand out player for us. At the moment I still feel he's got a lot to prove. We need him as a player who starts virtually every game to win us some matches. Wenger might claim Walcott is efficient, but he's hiding the fact that the player is yet to step up. One player who certainly has stepped up and not hidden away is Aaron Ramsey and I was delighted it was him who scored the winning goal. Whilst his confidence might not be sky high, he's not hidden away and let games passed him by. I thought Wenger was right to give him a breather. He's given everything in all the games he's played in this season and things haven't always come off. But seeing him at the back post last night coming onto that ball I thought he would only score. There would be no way he'd mess up this chance and he banged it into the back of the net. There has been a lot of creative responsibility put on the Welshman's shoulders this season, especially without Fabregas, Nasri and the injured Wilshere. He might not be ready for that pressure but he's never hidden and even when things aren't going right for him worked hard for the team, always making himself available to receive the ball. 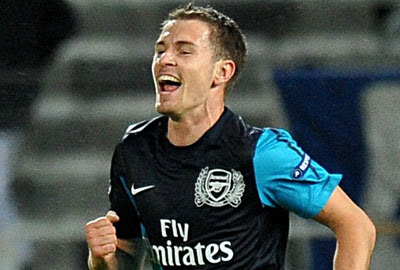 So I was really pleased to see him score and hopefully that will make him feel more confident. We're now top of the group. The manager had said the target was four points from the two Marseille games. So we're probably ahead of his schedule. Now we've got to look forward to playing Stoke on Sunday and I'm sure there will be a lot of practicing of defending of set pieces before then.